Larissa Brown of Stantec speaks to the public Tuesday in City Hall. NORWALK, Conn. – Criticisms of the draft city-wide master plan on Tuesday centered on the Wall Street area for some and the harbor for others. A series of speakers said there are too many plans being developed at once, at the Planning Commission’s public hearing on the draft Plan of Conservation and Development (POCD) — which would set Norwalk’s priorities for the next decade. “I urge you not to rush this through to get something off your plate. This is something that is going to be long term,” Harbor Management Commissioner John Romano said. The hearing was part one of two; it will continue next week at 7 p.m. Tuesday. The 290-page plan, which also includes 73 pages of appendices, was developed after a series of public meetings that began in late summer of 2017. Concurrently, the Norwalk Redevelopment Agency was working on the Wall Street-West Avenue Neighborhood Plan and the Parking Authority was beginning a parking study. Connecticut requires its municipalities to update their city-wide plans every 10 years. Norwalk hired Stantec to assist in the effort, and Stantec principal Larissa Brown on Tuesday offered highlights to the more than 50 people gathered in the City Hall community room. The vision that has been developed is “almost the constitution of the plan,” she said. Brown went on to explain Norwalk trends. 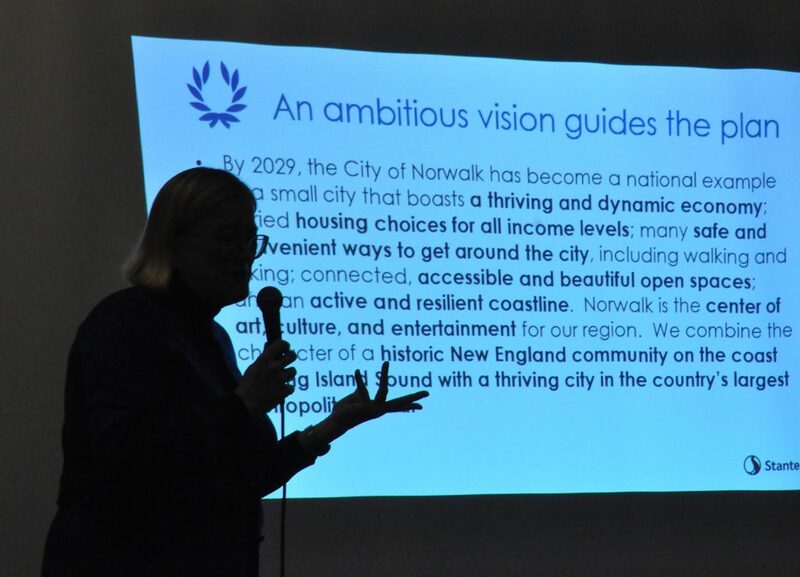 “Like many other communities, you are in transition from baby boom generation to millenials and what they call Gen Z,” and, “although people may think of Norwalk has having a population boom it’s actually in the grand scheme of things quite modest,” she said. Many small cities in New England would be very happy to see the kind of development that Norwalk is experiencing, she said. The overwhelming top priority listed by the POCD oversight committee, and by other citizens, was to rewrite and modernize the Zoning Code. That’s not uncommon: “there are tons of amendments and they get hard to understand,” she said. Survey respondents also expressed a desire for economic development. “That is something that in fact looks like it’s happening with the reorganization of city government,” she said. Schools are key and people also want to see better communication from the City, she said. Criticism of the neglect on harbor issues came first from Shellfish Commissioner Steve Bartush. The plan “seems to omit the ‘C’ in POCD,” Bartush said. The ‘C’ stands for “Conservation”. “Commercial and recreation shellfish depends on the larger subtidal and intertidal ecosystem and these ecosystems depend on water quality,” he said. Bartush noted that the Shellfish Commission worked with Harbor Management and the Mayor’s Water Quality Committee to submit suggestions. “We supported their recommendation that the ‘C’ efforts should have equaled the ‘D’ efforts so therefore we conclude that the draft POCD doesn’t support coastal conservation,” he said. He went on to express concern that a Dec. 14 letter from the Connecticut Department of Energy and Environmental Protection decrying insufficient analysis of coastal resource issues had been ignored. “For now, minus more of the ‘C’ we would have to give the draft plan a temporary ‘F,’” Bartush said. “The plan does not seem to reflect any of the remarks that we have made over time and those remarks go back many months — documentation of two in May and then the November one, none of it has been incorporated into the plan which is quite worrisome,” Romano said. Bike/Walk Commission Chairwoman Nancy Rosett said the Commission is pleased overall but would like to see a Complete Streets approach as a priority, with education and outreach efforts. “Everybody badmouths” the Wall Street area, Michael McGuire said. McGuire lamented that the plan doesn’t advocate for a Wall Street train station; Commissoner Nora King pointed out that it does, on page 191, which is in Part IV of the online document. “That is the nicest thing that anyone has said to me in 18 years,” he quipped. Adolph Neaderland closed out the hearing. If you dislike being a developer, how does it feel to be a real estate “mogul”? –	POCDs are required by Hartford, per state statute in order to be eligible to receive discretionary funding. As the state is broke for the foreseeable future – this is sort of moot. –	However, Norwalk still needs a vision, master plan and path for how we want to evolve as a city, so this exercise is a good thing. –	Larissa spoke of modest growth (0.05%) in Norwalk’s population over the past ten years and that most households had singles living in them. –	School data and city data appear out of step. It was an impressive roll call of speakers at the hearing last night, albeit the same cast of characters. Folks who fight for what’s right for Norwalk. I attended this hearing – listening carefully for a critical subject, and sadly – it was given almost no attention. 1. Develop high-quality materials and a web-site to market Norwalk as a business location. 2. Make tax incentive policies consistent and transparent; track & evaluate results. The State and this city are lost without a map when it comes to attracting businesses. Businesses are not re-locating to CT – they are leaving. Taking their tax base with them. Example? Diego this past week – that’s minimum 400 jobs and likely all 700 departing. The multiplier is devastating – all those employee’s will no longer spend their lunch dollars locally ($50×50 weeks time’s 700 employees’ is $1,750,000 alone. What about gas, manicures, booze (ya think? ), any & all other spending – not to mention the tax revenue generated by the business locally, and on the state level. Harry could only say “it’s unfortunate”. Bob Duff said – “we can’t compete”. Governor Ned, State Rep. Duff, Mayor Harry, and even Tim Sheehan (“unelected, unaccountable” – great comment from the Real Estate Mogul), have all stated their main objective is attracting population to CT – especially the transit heavy “gold coast”. Preferably millennial’s. Attract population – not businesses. The strategy? Feed the bloated beast with the two top sources of “revenue” (never called taxes, why?) – income and sales. The CT Mirror ran a story yesterday that unfortunately will encourage this plan. The Office of Financial Analysis (non-partisan?) revised a mid-November forecast up 464 million – 204m over their prior optimistic guess. This surge came from “paycheck” withholding (66% of the number), the real middle class folks, not from dividends and capital gains that signals wealth. Personal income tax is the single largest source of revenue – no chance the state can live without the Lowell Wicker legacy. Further, sales tax – the 2nd largest source – was also projected up 80m. I’m sure New is ecstatic. Only one problem. The budget deficit remains at about 1.5 billion. So now what? This is the reason our elected officials and appointed committee members are so hell bent on fortress sized apartment development, no matter the public opinion. The bas-ackwards thinking is – if we build 20×20 micro-apartments, keep putting up heavy subsidized POKO affordable housing stock, the millennials will come in mass. And once businesses realize we are hoarding all this youth – they will have no choice but to relocate to Norwalk. I applaud longtime resident John Romano and the other Harbor keepers for advocating protection for our coast – being “shellfish” for us. Mayoral candidate Lisa Brinton delivered a succinct, rational outline that put some sunshine on the dichotomy of the character 1st POCD plan and the Redevelopment Agencies grandiose Big-Big-Big plans. Mike McGuire had some of the best sound bites – his suggestion to just lean into one (hit by pitch) was an instant classic, and Jason “the mogul” Milligan proved he is a professional who remains accessible and interested in a dialogue – both the best advocates Wall Street could have. And missing from this coverage, Ms. Donna Smirniotopoulos presented a comprehensive argument for “the people’s plan” – questioning the rationale for micro-apartments and high density TOD development. Her comment received a spontaneous burst of applause from those gathered – except from the dais. Her prepared remarks showed a level of civic engagement that deserves respect, and appreciation. So, sorry this is such an epistle, but this is the cross roads for the city. The “survey” said – Norwalk respondents “expressed a desire for economic development”. That mean’s let’s change the ratio where 90% of the city is funded by residents – to more business development and contribution, but Stantc’s Brown interpreted this with “That is something that in fact looks like it’s happening with the reorganization of city government,” she said. Goes to show you people will say anything for a check. The mayor’s re-org doesn’t show development – it exemplifies the city hall attitude that spending tax dollars is their royal right and privilege, the over-taxed residents be damned. Norwalk – you got one more shot at this – the 22nd. Remember the committee is stacked with Harry appointee’s – who “share his vision”. That vision is the State’s vision. CRAM as many people into this area as possible – so income and sales tax receipts grow greater than the losses suffered from businesses leaving in droves. Is this what you want? Is this your vision? Make your voice heard. Norwalk has long been a transient commuter City with a very small business sector and poorly positioned governance surrounded by wealthy attractive towns and fine public school systems. Does anyone familiar with basic developmental economics really believe Norwalk can be transformed by a former Police Chief and other elected officials lacking business backgrounds ? Does anyone believe Norwalk’s current “team” can create a City attractive to new homeowners with rising, not falling property values ? Of course not. That’s why we have a stagnant Grand List for a decade. Business avoids poorly governed Norwalk. Master plans are the stuff of Mayoral campaigns. Especially in a City lacking highly qualified business development professionals. Mayor Rilling and his “team” lack the capability to transform our shabby Downtown into an attractive City center. Nothing changes in Norwalk until we elect officials with major league business expeience. And that’s not likely. My mogul status was limited to the Wall Street area. Lisa Brinton and another woman spoke so well at the meeting and brought up so many good points that I felt I had no need to speak after they did. If these two woman were running Norwalk it would be great. I wish I knew the other woman’s name because she deserves mention as she was so on-point!! I am going to speak to Lisa Brinton at a CNNA meeting she shares a lot of what I think Norwalk needs. Smart development, no more apartment buildings, a professional city planner, accountability to the taxpayers, and overhaul zoning to name a few. Lets see who the republicans run and hopefully they put someone in who actually has a chance this time or they endorse Lisa. If we find the name of the other woman who spoke, anyone at the meeting will know who I’m talking about ask her to either run for mayor or as Lisa’s newly created chief of staff position. That would be a win for Norwalk and the taxpayers. Donna S is her name. She is very smart and articulate. BTW, I had the opportunity to drive around the area today. You did a nice job of tidying up the strip where the old chinese restaurant was. Hopefully you’ll get a tenant in there soon. Lisa Brinton, Donna S., Jason Milligan, Michael McGuire, John Romano, Debora Goldstein. I am happy to see that Mr. McGuire was finally asked for further input. Long overdue, but great progress. Out with the old, in with the new! We need a Norwalk Dream Team to just get it done! When its time to vote, Common council will respond by simultanously praising our city and giving its overburdend taxpayers the middle finger. Municipal development professionals know that its “local government competence” and “respect for that competence” by the business community that are the essential requirements for major league succcesfful development. Norwalk has niether. Stamford did and reinvented its City. Development “master plans” and more “meetings of hope and change” make good newspaper copy ahead of re-election campaigns. But City residents seriously interested in municipal development ought ask whether the “team” put in place by our former Police Chief has the professional credentials to change our shabby Downtown. Those of us with major league business experience have no doubts about the answer to that question. As does the CT business community. Just ask them. There’s a reason why Norwalk is viewed as the “hole in the middle of the donut” by residents of our surrounding well managed towns and the business community.